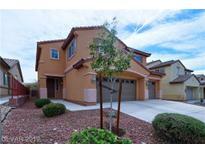 Below you can view all the homes for sale in the Lone Mountain Losee subdivision located in North Las Vegas Nevada. Listings in Lone Mountain Losee are updated daily from data we receive from the Las Vegas multiple listing service. To learn more about any of these homes or to receive custom notifications when a new property is listed for sale in Lone Mountain Losee, give us a call at 702-323-5963. Oversized Master Bedroom W/Balcony Overlooking Walking Trails Behind, Great Lot With No Direct Home Behind You! MLS#2086222. TR Realty. Security system has 6 cameras and auto lighting. MLS#2083697. Realty ONE Group, Inc.
Gorgeous move in ready home with Island in Kitchen, raised panel cabinets, stainless steel appliances, granite countertops, walk-in pantry, water softener, reverse osmosis, fireplace, beautiful stone wall, wine fridge, bedroom, and full bathroom downstairs, large loft and laundry room upstairs, Jack and Jill bathroom upstairs, spa-like master bathroom with separate tub and shower, double sinks and two closets, call with ? ? MLS#2077227. Realty ONE Group, Inc. Convenient to freeways, schools, shopping, restaurants, & more MLS#2070467. American Realty Properties LLC. Nothing left to say but "Welcome Home." MLS#2070013. HomeSmart Encore. Lots of space to enjoy. Rare find. MLS#2040730. Crossover Realty. Come view today! !LEASE BUYOUT-30 DAY MOVE-IN MLS#2024573. Turn Key Property Solutions. Large master with double sinks, walk in closet & shower.LEASE BUYOUT-30 DAY MOVE-IN MLS#1993869. Turn Key Property Solutions.